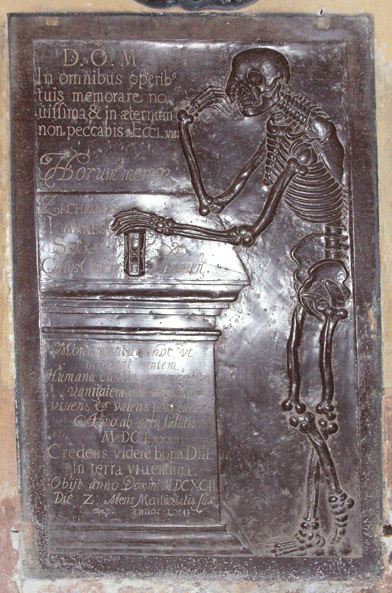 Frombork Cathedral, on the eastern shore of the Bay of Gdańsk, contains a very large number of incised slabs and other monuments to members of the Cathedral Chapter. Frombork (otherwise Frauenburg) was in the little Catholic enclave of Warmia (otherwise Ermland) surrounded by Protestant Prussia. Although much of the population was German speaking, these two late seventeenth-century Canons were obviously Polish. 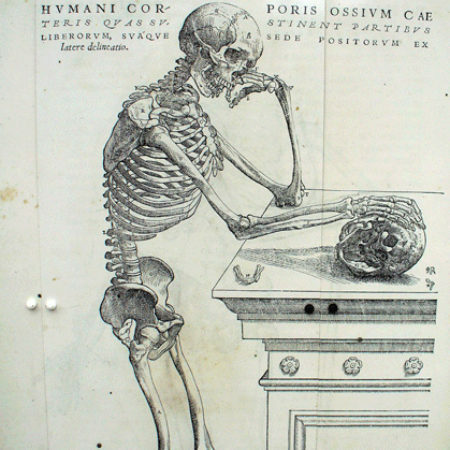 Their peculiar interest is that they are shown as skeletons leaning on inscribed plinths. Canon Szolc is on the north side, on the eighth pillar from the west, Canon Bużenski on the south, on the fourth pillar from the west. One is a mirror image of the other, both facing east. 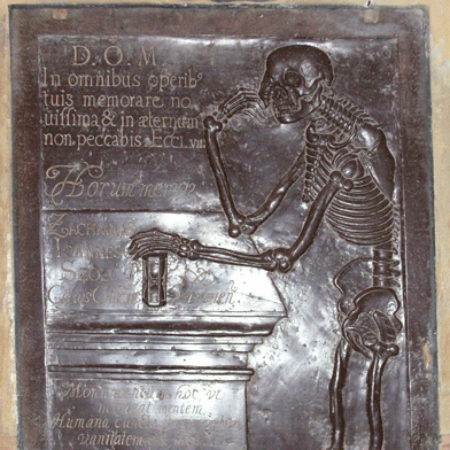 Canon Szolc came first; he was custodian of the Chancellary of the Diocese of Warmia, and prepared his slab in 1682, “being alive and well”. 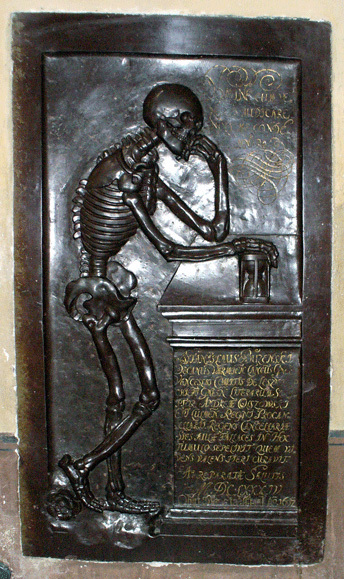 Canon Bużenski followed two years later; he was Dean of Warmia. Both died in 1692, the dates being added to the slabs. 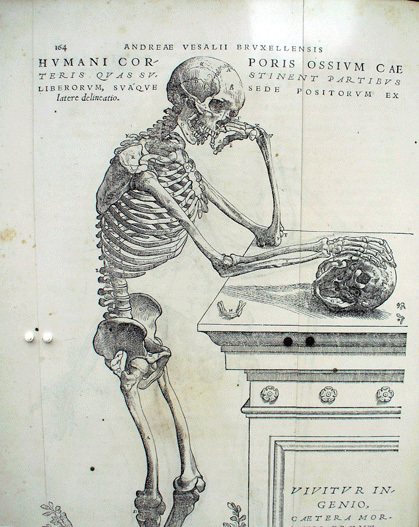 What is remarkable is that they are clearly copied from an engraving in a book of anatomy, De Humani Corporis Fabrica, by Andreas Vesalius, 1543, as shown on the temporary hording surrounding the Bodleian Library’s extensive transmogrifications. 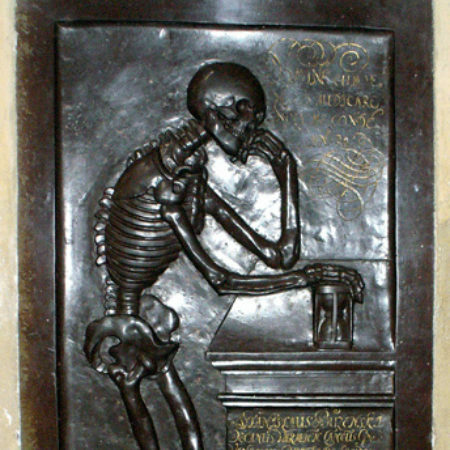 The only significant difference is that the Frombork skeletons ponder an hourglass instead of a skull. That such a book was in the Chapter library need not surprise us: the Canons of Frombork were very erudite, indeed one of them, Mikołai Kopernik, received a special commendation from the Pope for his interesting astronomical discoveries in the 1540s.